Home Amazon Monopoly Cheaters Edition Game (Hot DEAL) 1 Day Only! The Monopoly Cheaters Edition Game is on sale on Amazon! Hurry and get the Hasbro Gaming Monopoly Cheaters Edition Family today for only $19.99 $10.07 from Amazon! Make this wildly different Monopoly game a favorite go-to game for game nights and other fun get-togethers. Lean into those iconic (yet unspoken) Monopoly moments in which rules are bent, money is borrowed, and funny business is welcomed. The outlandish suggestions on the board, cards, and rules encourage players to express their inner cheater to own it all while they buy, sell, dream, and scheme. Fake a die roll, steal some bills from the bank, and even skip out on rent. Complete a cheat to get a reward, but fail a cheat and pay the consequences! 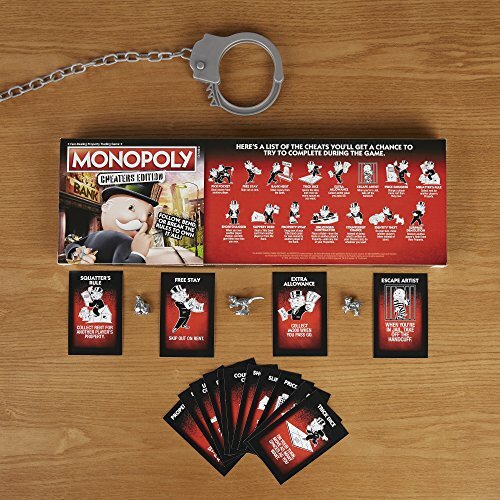 No houses in this edition – only hotels – and pretend handcuff unit may leave players “chained” to the board. The Hasbro Gaming, Parker Brothers, and Monopoly names and logos, the distinctive design of the gameboard, the four corner squares, the Mr. Monopoly name and character, as well as each of the distinctive elements of the board and playing pieces are trademarks of Hasbro for its property trading game and game equipment. Buy the Hasbro Gaming Monopoly Cheaters Edition Family from Amazon.